New London The population was 4,397 at the 2010 census. In 1753, the Masonian Proprietors of Portsmouth, New Hampshire, granted the area now called New London as “Heidelberg”. Although it appears on some New Hampshire maps, the township was never settled, and the 1753 grant lapsed into default. In 1773, roughly the same area was awarded as the “Alexandria Addition” to a new group of speculators, who had previously been granted the adjacent township of Alexandria. These proprietors were led by Jonas Minot of Concord, Massachusetts, but the others were Scotch-Irish immigrants living in Londonderry, New Hampshire. None built dwellings in the Alexandria Addition. Instead they recruited settlers to build roads, mills, schools, and a church—all increasing the value of their land holdings. Nearly all of the original settlers came from Massachusetts, either from the Amesbury area of the north shore or from the Attleboro area in the southeast. The township proprietors soon began a long, systematic process of subdividing and selling their properties at great profit. By 1779, there were sixteen families recorded within the bounds of the Alexandria Addition, and they petitioned the General Court to incorporate as the town of “New London”—officially named after London, England, but perhaps also an acknowledgement of the Londonderry-based proprietors. The first town meeting was held on August 3, 1779. 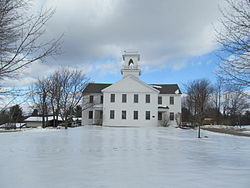 In 1807, the northern half of New London was annexed, merged with an area called “Kearsarge Gore”, and then incorporated as the town of Wilmot, New Hampshire. In the early 19th century, there were three small additions to New London, including the village of Otterville in 1817. This entry was posted in Kearsarge, Towns and tagged Area Information, Blinds, History, Kearsarge, New London, Shades, Towns, Wilmot.